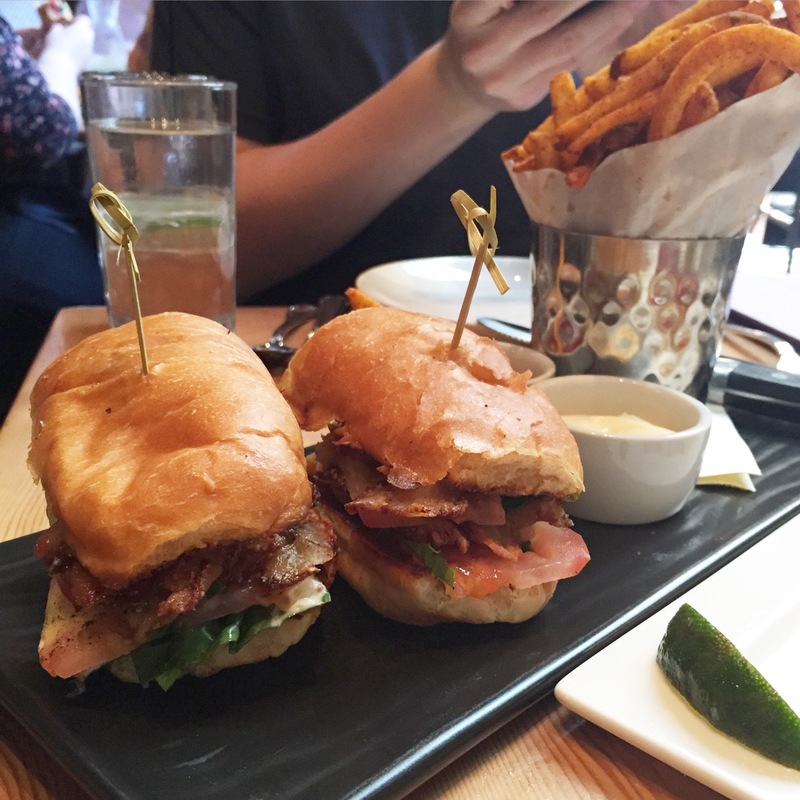 New York – Eat. Rest. Repeat. With all the different cultures that inhabit the city, you can get a taste of each region of the world without having to leave the country! You could wander around the different boroughs for years and years and still have decades worth of exploring, and THAT is what makes this city so amazing. Side note: My husband’s friend, Devon, was kind enough to take us around NYC a few months back….and that’s how I ended up taking the photo above. He took us to Dumbo, a small area with amazing views. If you’re doing some touristy things around the city, I highly recommend going to Dumbo when you get a chance. With the chaos of city life, the scenery gives you an appreciation for life, and the quiet, slow moments you wouldn’t expect to get in New York. As with my previous post on Chicago, this will be a “catch up” entry on some experiences I had recently in New York. I can’t even put into words how freaking fantastic this place is. The outside is very unassuming. In fact, when we hopped out of the Uber, my husband and I looked at each other like, what the hell did we get ourselves into? Before you enter the restaurant, you go through what appears to be a pawn shop. It’s this discrete little store front with an entrance to the restaurant in the back. Genius! When you finally access the restaurant, you immediately feel like a VIP…like you’re an exclusive member of a club. The interior is immaculate. So well decorated, I would describe it as a ballroom meets a prohibition bar meets a green house…it’s hard to describe, but you get the point (I hope). We went for Sunday brunch. I was a little disappointed in the menu, but the quality and taste of the food blew me away. If I could have put that in larger font, I would have. 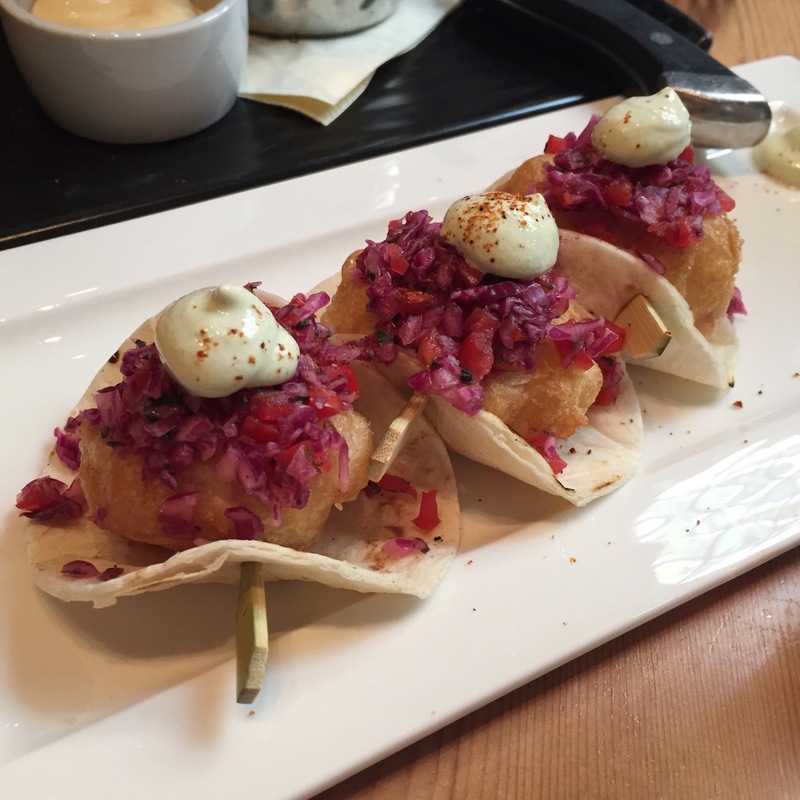 First thing pictured: lobster tacos. Okay…I wasn’t expecting deep fried hush puppy looking lobster, but I’ll take it! The batter was light enough that you get some pretty large portions of lobster inside, while keeping the lobster moist and succulent. I rate this dish an A. The following dish featured, I give an A++. 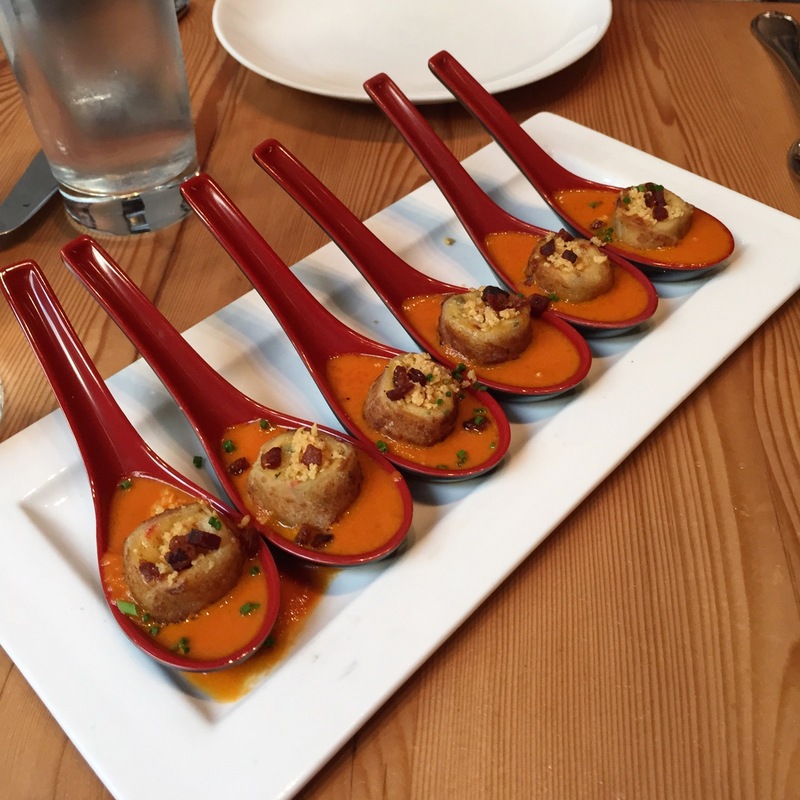 Grilled cheese soup dumpling in tomato bisque, topped with bacon. PHENOMENAL. Who comes up with such brilliance!? And for an appetizer, you get a pretty good amount! Delicious. And those fries? Talk about CRACK FRIES! I mean, HOLY CRAP. If you’ve ever had HopCat’s “crack fries”, the ones at Beauty and Essex puts that to shame. I seriously can’t wait to go back, and I highly recommend this place to ANYONE and EVERYONE! I came here for dinner a few months ago….not bad, I’d say. The restaurant decor was….hipster. Actually, I don’t know if that’s the correct word to describe it. It has a certain style that makes it seem trendy, but classic at the same time. The drinks were superb, and the choices on the menu were ideal for someone with my taste….it was almost as if they put the menu together just for me! The pictures below are some of the items I had ordered…. 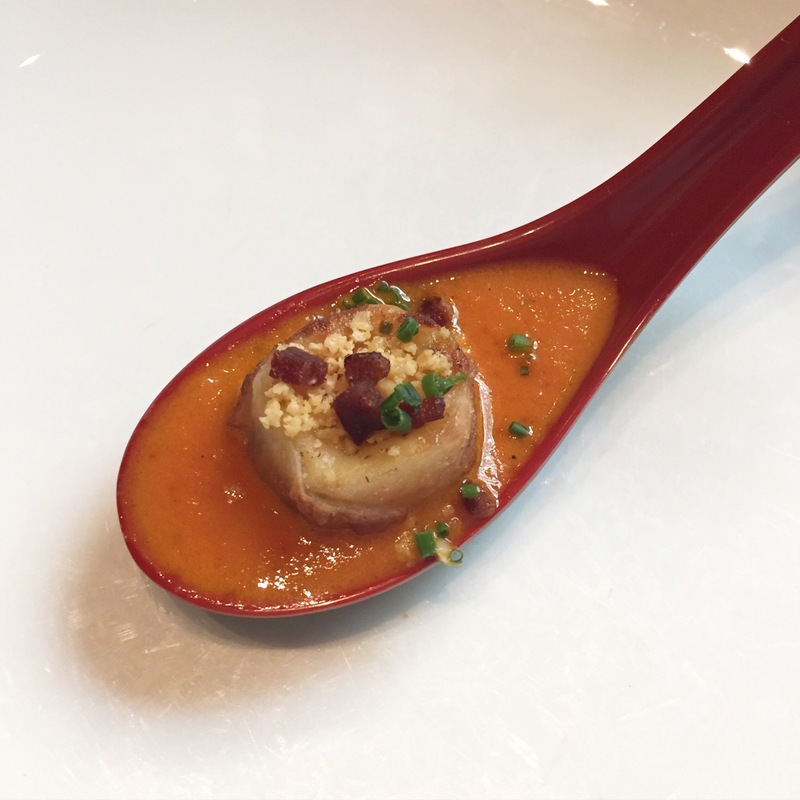 First up….chicken liver mousse and roasted bone marrow. 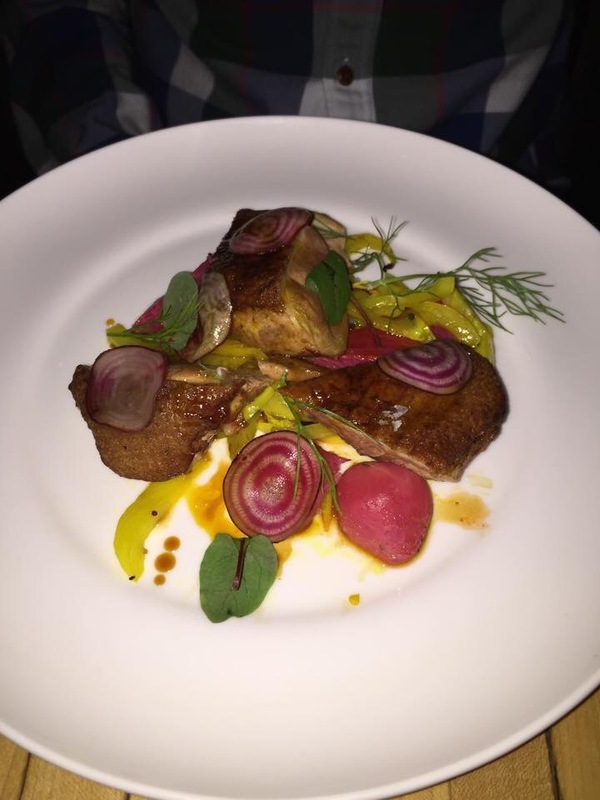 I have been on this chicken liver kick lately; I NEVER hesitate to order it. Because it is not commonly seen on menus, I always find it completely necessary to order it whenever I find an opportunity. 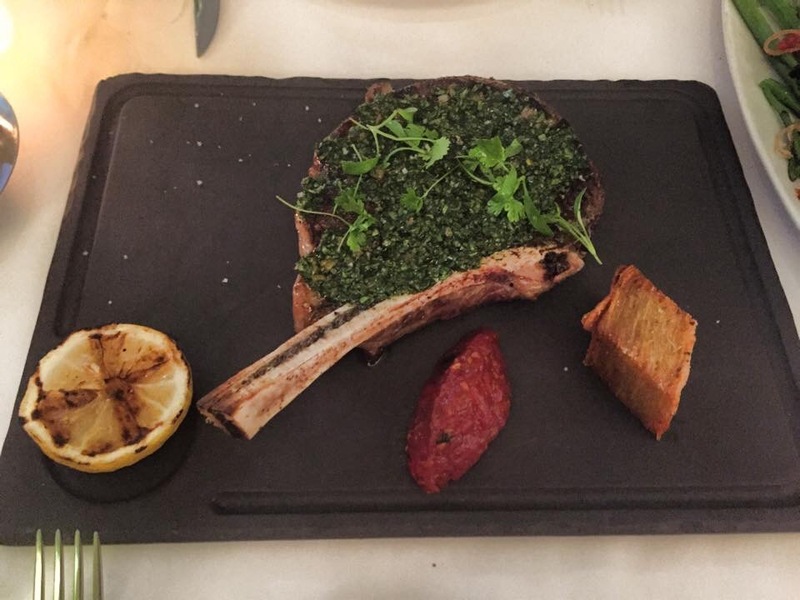 It certainly did not disappoint…however, the roasted bone marrow did. I prefer a simpler roasted bone marrow…drizzle some olive oil, sea salt, capers, and a squeeze of lemon and I’m all good to go….but this had some weird stuff on it. Chunks of bread crumbs overwhelmed my bone marrow….which would have been fine if it wasn’t meant to be spread on toasted bread. Bread on bread? No thanks. And that slaw? Irrelevant. 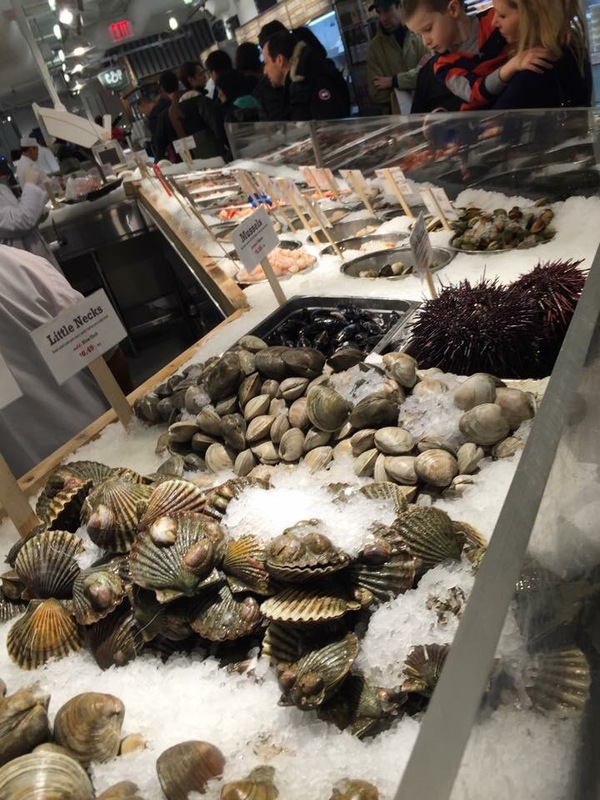 Scallops…..meh. The scallops were cooked PERFECTLY…but the rest of the dish, not so much. The veggies just didn’t do it for me. I’m all about accompanying proteins with a good vegetable…but I just was not into it. I’m not sure if their menu changes with the seasons [I hope they do], but they should probably consider playing around with some other choices of veggies. 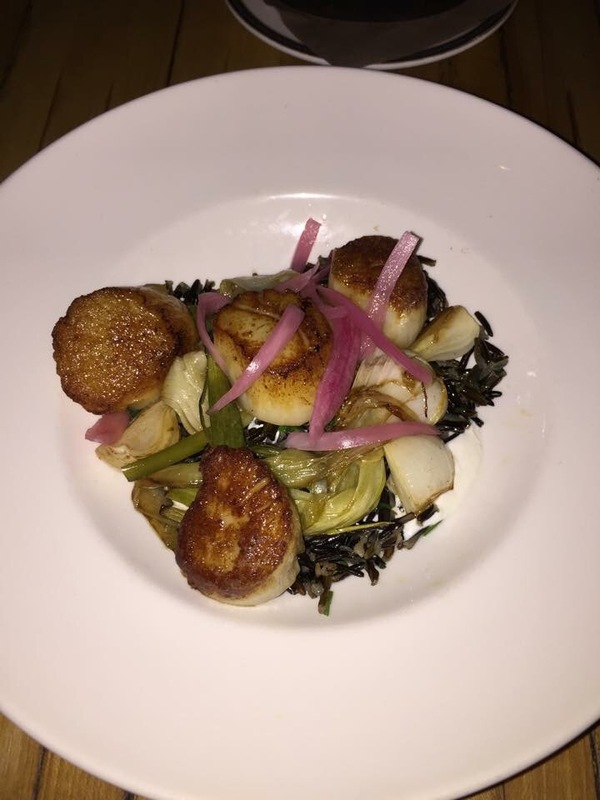 The wild rice underneath was a nice touch; it made the dish a little heavier, but didn’t overshadow the scallops. Below was the Manhattan my husband ordered. 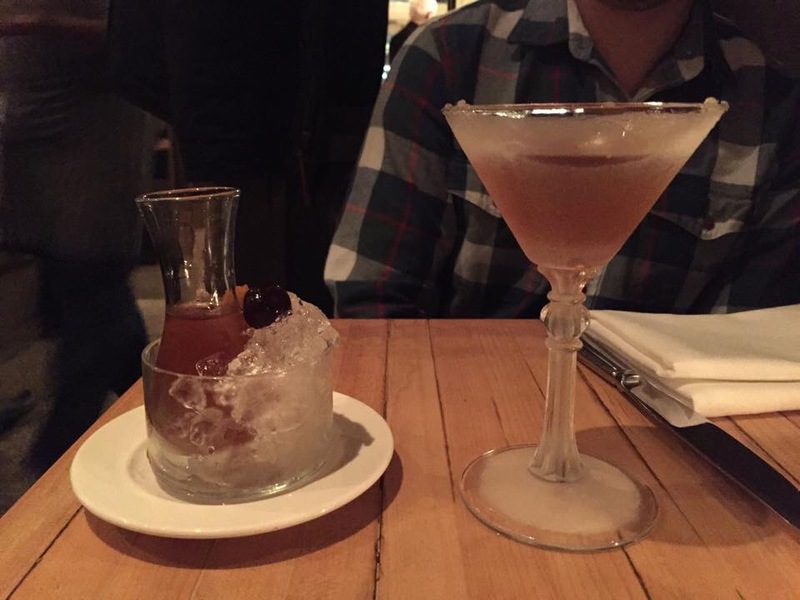 The extra carafe was a nice touch; might I mention, their Manhattans are on tap! Which means, all the flavors are able to really develop while they sit and stew together. This place is definitely worth checking out! This is probably the most amazing thing in Manhattan. It was love at first sight. Everything a foodie could want or need is HERE. Fresh seafood, small local vendors, spices and teas galore! 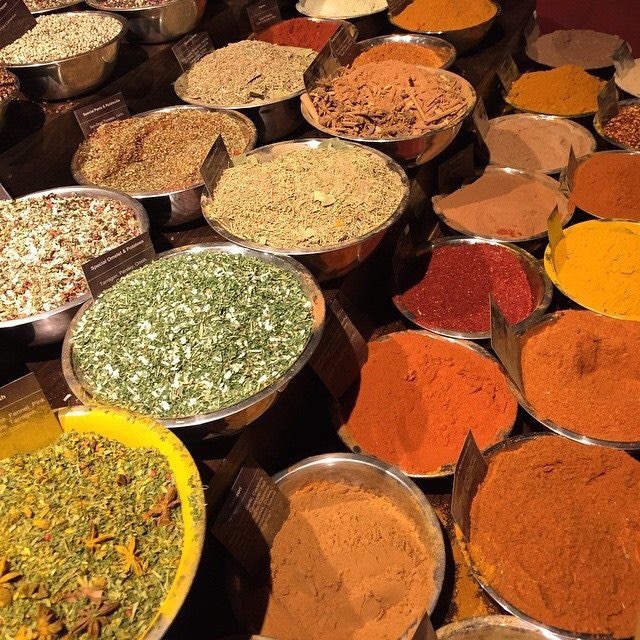 An indoor market full of the freshest ingredients, innovative restaurants, and baked goods….I would move to NYC just to be able to visit this mecca. If you haven’t had a chance to see this place...you’re totally missing out. Italian fine dining on steroids. This place was pretty incredible…you definitely get what you pay for. I came here for lunch about a month ago and was genuinely awed. They had a special for lunch ($47) which includes your choice of an appetizer and an entree. My appetizer: razor clams. You get about 4 of these bad boys in your appetizer, and they are HUGE. This alone filled me up…and my husband had his own appetizer so he was hesitant to help me eat mine. The toasted bread was the perfect accompaniment, as the broth was perfectly spiced for dipping. 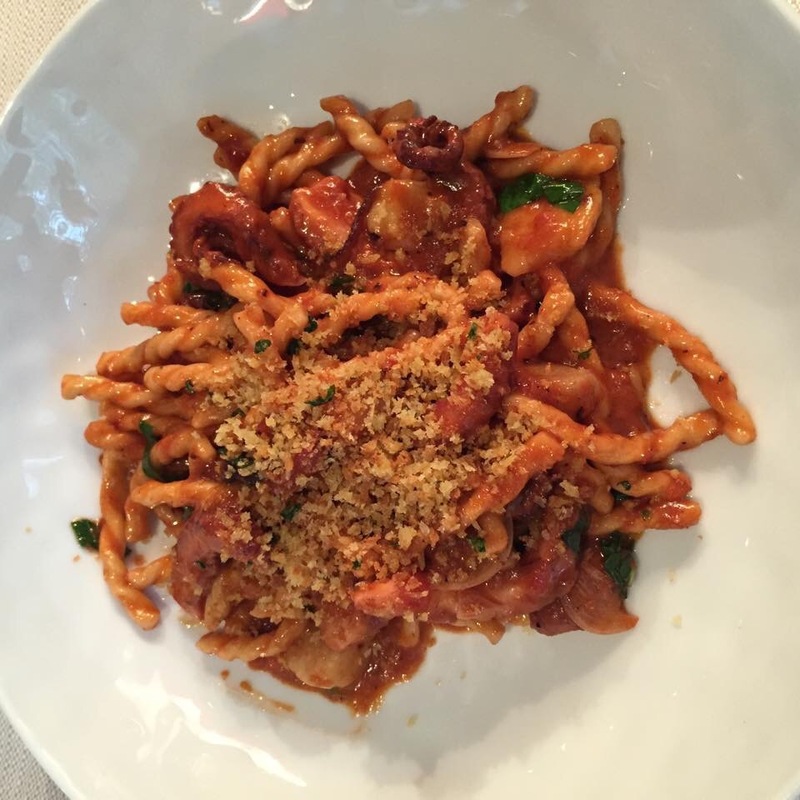 My entree: fusilli pasta with bone marrow and octopus. This was entirely too rich as a lunch course. It was delicious, don’t get me wrong, but a tad too heavy. The bone marrow came in large chunks….I didn’t fancy that. The texture of the large chunks of bone marrow made you feel like you were just eating globs of lard: tasteless and fatty. The tentacles of the octopus were very tender and nicely prepared (because who likes rubbery octopus? )…although I’m not sure I understood the vision of mixing that with the bone marrow. The pasta had a nice bite; I really enjoy chewy pasta, so I am always excited when a restaurant gets it right. The atmosphere is very….ritzy. Going in sandals made me feel like an undeserving commoner. This is a really nice place to celebrate an occasion (anniversary, promotion, birthday), but I wouldn’t recommend this as an everyday spot. This is another restaurant that completely blew my expectations out of the water. I was mesmerized by this establishment. I cannot speak highly enough about this restaurant. Immaculate. Tasteful. Classy. Timeless. 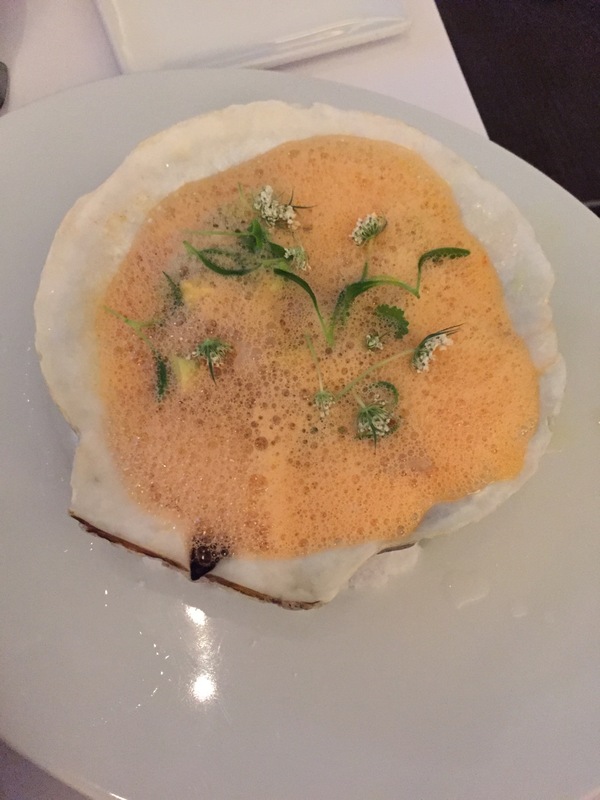 First up: Scallop ceviche with carrot foam. I find all foam to be unnecessary….even in my cappuccinos. Here’s another one of my current obsessions. 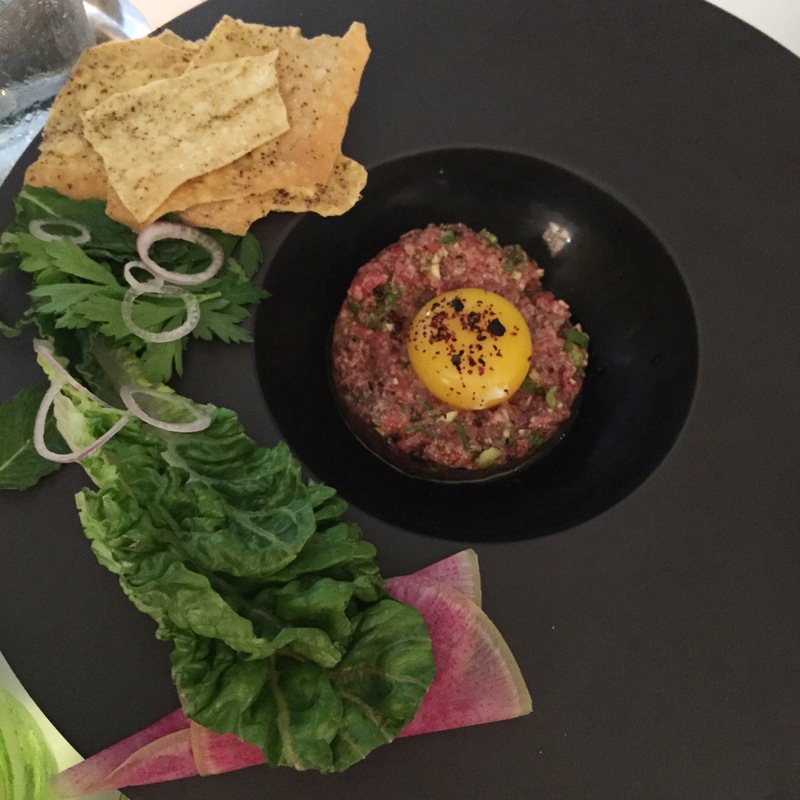 Much like the chicken liver mousse discussion we had earlier, beef tartare is another one of those menu items that I will never pass up. The flatbread that they provide could use some work, and the spices kind of tasted like fajita seasoning….but the beef was fresh with impeccable flavor. Finally, the entree: 16 oz Ribeye. I don’t remember what the herb paste was on it, but it was like a chimichurri, only better. Waaaay better. That little cube on the side? That was a potato. Probably the best potato I’ve ever had, in any form. It was sliced paper thin, but not cut all the way through so that it was still held together. The tomato paste? I could have gone without it. Tasted too much like ketchup. I know what you’re thinking…what the hell is this concoction? I was wondering the same thing as I watched it being brought out to all the surrounding tables. It is something that is definitely unique to this restaurant, and this restaurant ONLY. They call it “Grapefruit Givre“. 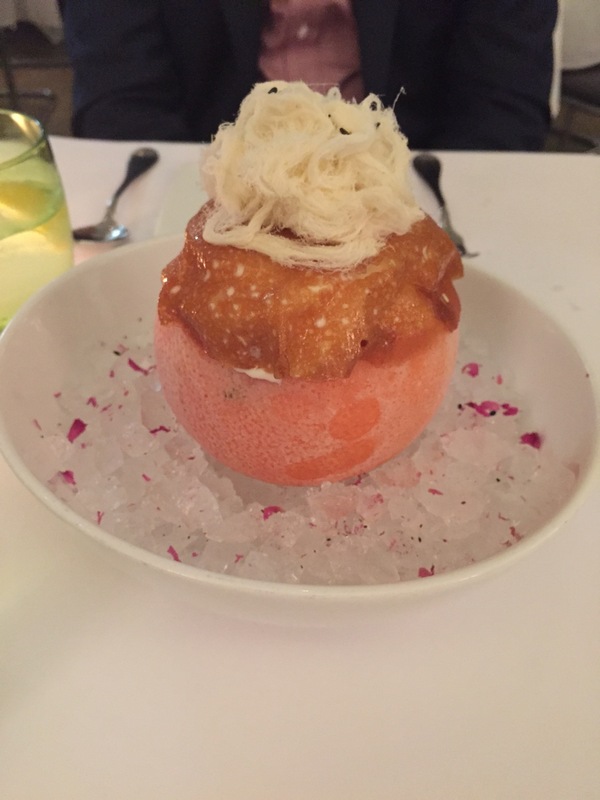 What it is: grape fruit sorbet, stuffed back into an empty grapefruit, with rose loukuom, and sesame halva. I don’t know what that stringy stuff is at the top, but it was like cotton candy. This dessert definitely sealed the deal. It took my already highly impressed opinion to the next level. My husband and I got into the show, “Mind of a chef” recently. That show introduced us to Chef David Chang, the owner of Momofuku. We went there for lunch, as soon as we landed in NYC. Hauled our luggage in a cab, and made our way to this packed restaurant. By chance, just as we ordered our food, David Chang made an appearance! He was only there for 5 minutes, and was glorified by all the patrons. My husband loved the food. Unfortunately, I didn’t feel as strongly about it. 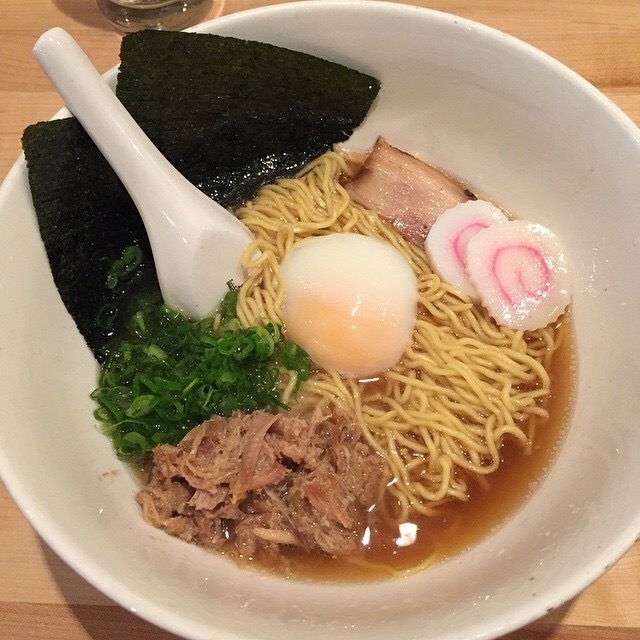 The food is simple, it’s rich, and it’s good….but have I had better ramen? Yes. In this case, it just didn’t live up to the hype. We walked two miles to this place….only because we knew we were going to eat like starving children once we got there. You know how things always taste better when you’re hungry? Totally disappointed after walking 2 miles in the summer heat. 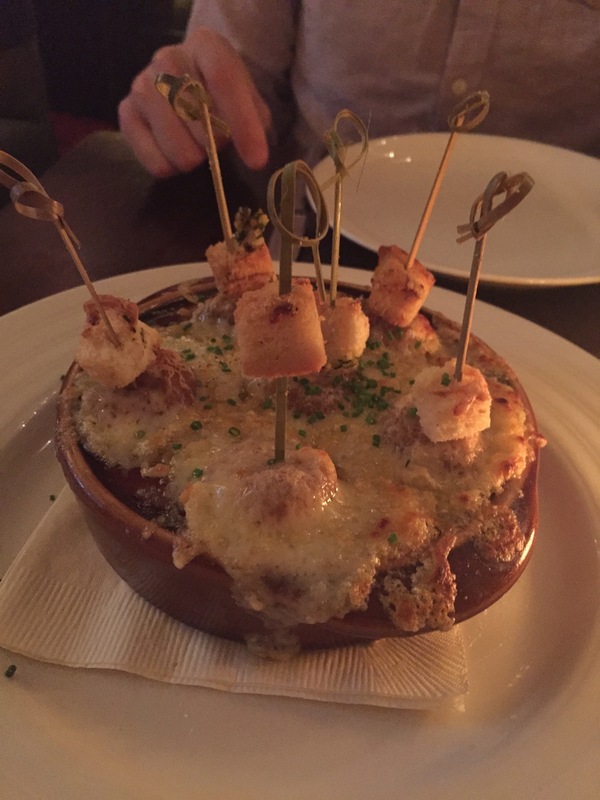 So this is their claim to fame…..french onion soup dumplings. I LOVE french onion soup, and being half Taiwanese, soup dumplings are totally my thing….but this was just awkward. I didn’t get it. I can’t understand why people like this. SOOOOO overrated. 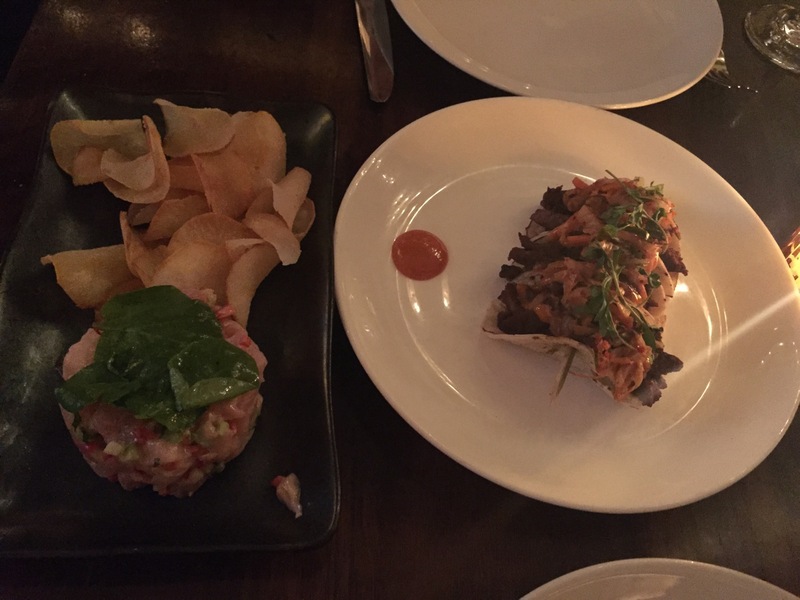 Next: hamachi tartare with some kind of root chip…and I think those were korean beef tacos. Sorry, I can’t remember things that aren’t memorable. These dishes were just okay. 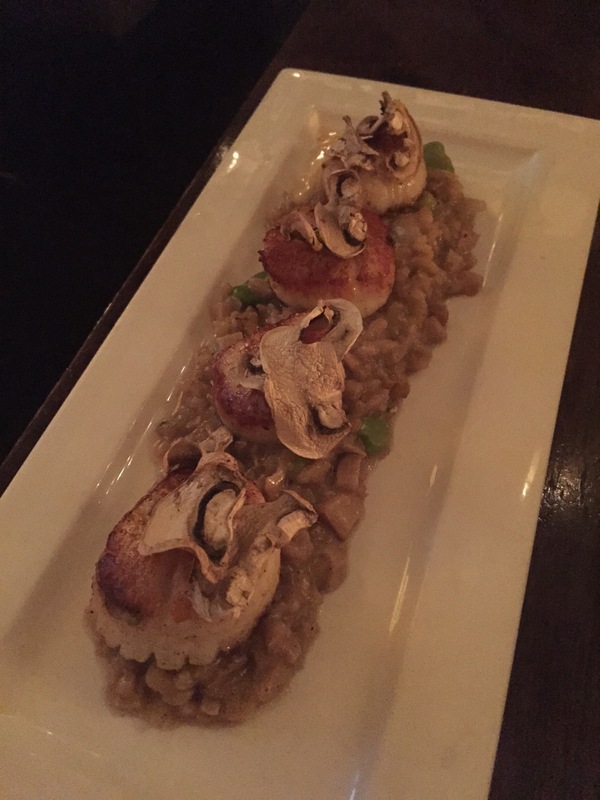 My entree: Scallops and mushroom risotto. Gag. These scallops…the texture…the smell…the first one was fine because I was still hungry, but after that, it just started to gross me out. The risotto was not cooked well at all. The rice was chalky and unfavorable. 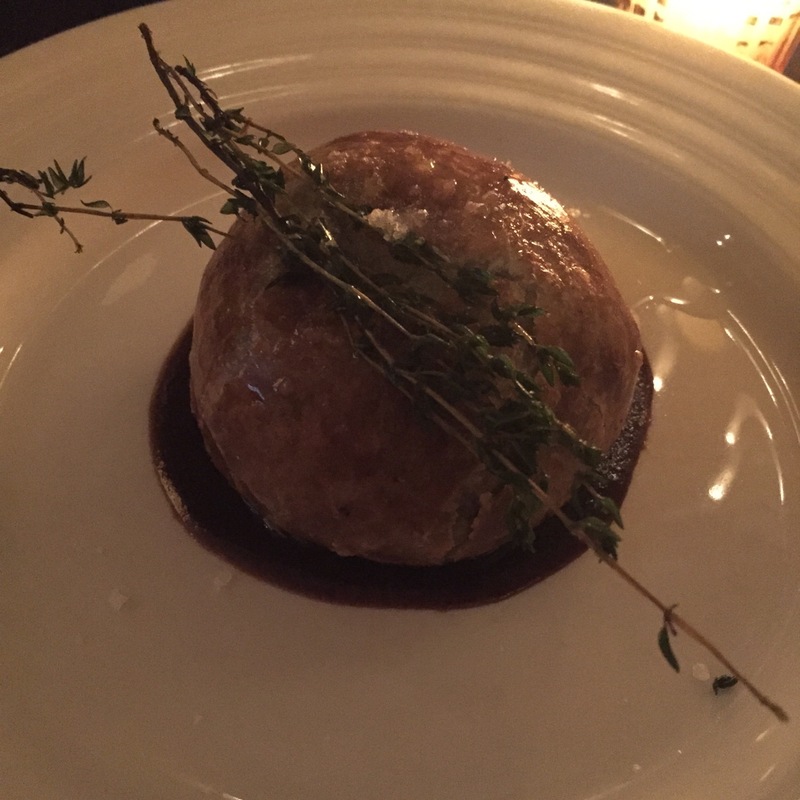 My husband’s entree: Beef Wellington. This was probably the best dish of the night. No complaints…probably should have taken a picture of the inside, but by the time we got to tasting it, it was gone in seconds. The ambiance was nice, but the food wasn’t anything special. I’ll be back in NYC in November, so if you have any suggestions, let me know! Pingback: NYC: Chelsea | Eat. Rest. Repeat. 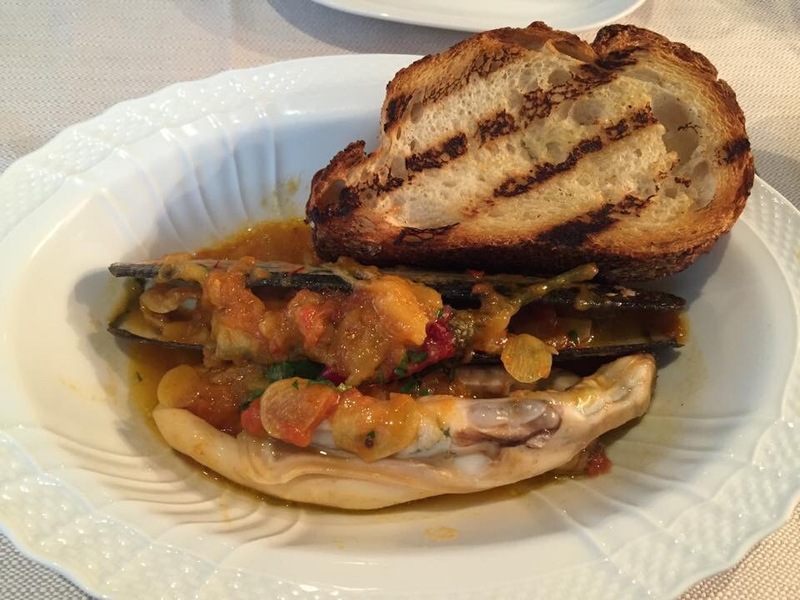 Pingback: NYC: Cafe Boulud | Eat. Rest. Repeat.